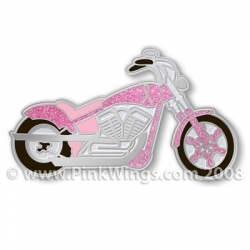 Motorcycle Pink Ribbon Pin This awesome Cloisonne pin is in and ready to ship. The pink on the motorcycle is Glitter and looks awesome!! There is a pink ribbon on the motorcycle and notice the pink ribbons for the spokes. This is a great pin for all you motorcycle riders out there and makes a great gift for motorcycle crew on the Avon and 3 Day walks! !